After paying virtually no attention to wildlife in the previous 35 years, I’ve been amazed at how much my attitude has changed since I crossed the Pacific. I blame the Koalas. Ever since then I’ve been going more and more out of my way to find unusual things both on land and underwater. Seeing the Tarsiers had fulfilled my terrestrial cravings for the moment, but I was soon hungering after a fix of big underwater action – so I headed north, to Malapascua, one of the few places in the world where you can relatively reliably dive with Thresher Sharks. I say reliably, but in fact I’d met a couple of people who’d tried on several occasions and failed. Despite hearing this slightly dispiriting news, I was determined to give it a go – this could be a once in a lifetime opportunity. When you’ve been traveling for a while, it really feels like everything worth seeing inevitable involves an early morning start. The sharks were no exception – best time to see them is early morning, so I was up at half five to get on the boat at six, for what would turn out to be the most boring dive I’d ever done. There’s one place the sharks hang out, so we descended, sat on the bottom, and waited. And waited. There’s pretty much nothing else to see, and the visibility’s not great. And so we waited for about 40 minutes, and then gave up and came back up. But I wasn’t disheartened. I’d been prewarned that my chances weren’t high, so I remained cautiously hopeful (if not entirely optimistic) for the next day. Yet again we had a pretty early start, and the dive started very similarly to the previous one. But half way through our luck changed, and a big shark swam right past us – our guide reckoned it was up to 4.5m long (with half of that being the huge, characteristic tail), and we got a good look at it as it slowly went by. That was the only one we saw that day, but that wasn’t it for the show, for a few big devil rays soon turned up and flew around for a while. Not quite as unusual as a thresher, I know, but seeing the devil rays confirmed my view that rays are the most beautiful, graceful creatures in the sea. With mission accomplished, I felt like I’d earnt a beach day. And I honestly could not have wanted a better place for that than Malapascua. 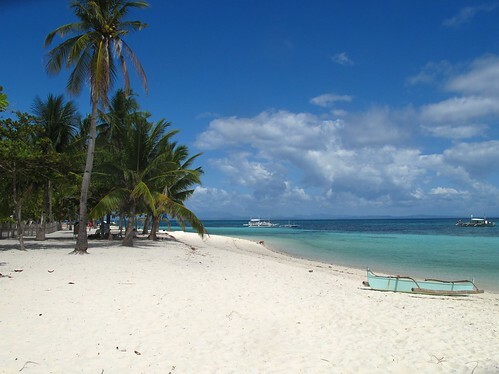 The island is pretty tiny, and sits off the north coast of Cebu, right in the heart of the Visayas. It’s probably my favourite island so far – in part because it’s the friendliest place in what is already the friendliest country I’ve ever been to. Everyone stops and says hello, everyone wants to help you out, and even the people selling stuff are low-pressure, friendly and chatty, preferring to win you over with charm and humour rather than trying to bludgeon you in to submission. 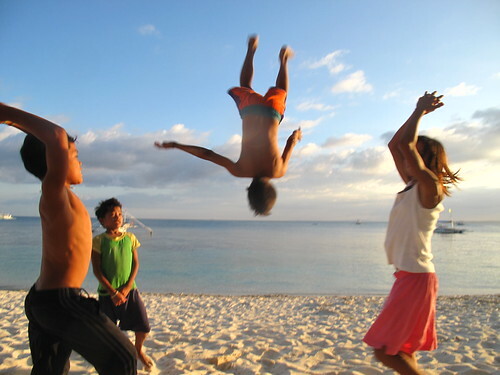 They were saving the best til last though – just before sunrise they put on an amazing acrobatic show for us, backflipping and somersaulting and cartwheeling down the beach, throwing each other up in the air, fearlessly reaching heights I’d be terrified by. It was pretty amazing stuff and reminded me you don’t need to spend forty minutes under water in scuba gear to see cool stuff. After all that hard work, they didn’t need to work hard at all to sell us stuff afterwards – we bought them all sodas, and then parted with more cash for the shells they were selling. Despite now having a bag full of shells I’m not sure what to do with now, it was a small price to pay for such a cool show. You can see all of my photos of Malapascua here. Next up: The final stop on my wildlife-spotting tour of the Philippines – chasing after Whale Sharks in Donsol. You may have noticed that this blog has become increasingly monkey-obsessed of late, what with posts on the cheeky macaques of Bali, the amazing orang-utans of Sumatra, and the naughty Small Monkey in Palawan. If you’re not a fan, you’re going to have bear with me a little while longer, as travelling from Palawan to Bohol gave me the chance to see a rather unusual relative – the world’s smallest primate, the Philippine Tarsier. 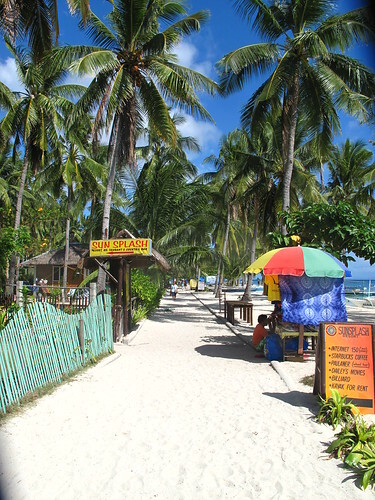 Getting to Bohol is pretty easy – a short flight to Cebu City, two hours on a fast ferry and half an hour on a motorised tricycle and I was swiftly at home in a beautiful little room right on the beach, above the Genesis dive shop. Wreck diving in Coron had been fun, but I was looking forward to getting back to a more traditional coral and fish environment, and the reefs of nearby Balicasag island didn’t disappoint. 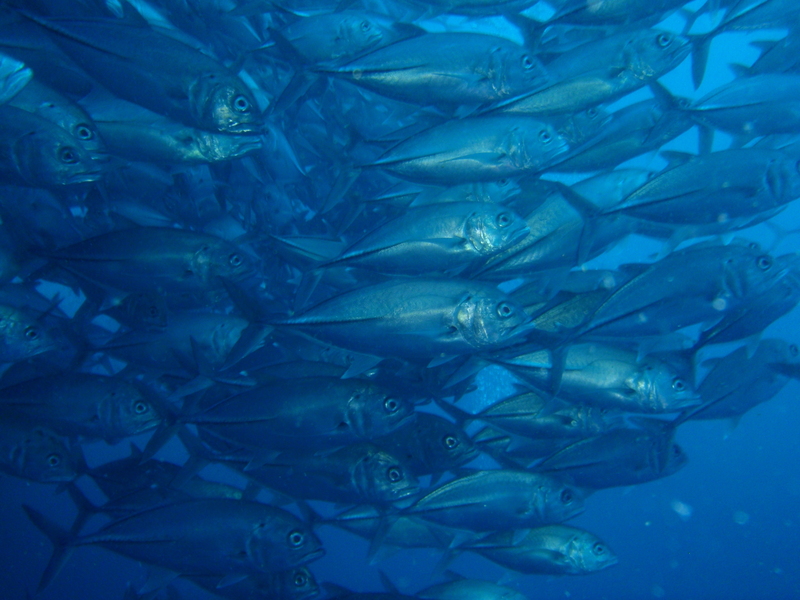 My second dive in particular was stunning – we came across a huge school of jackfish, swimming in very tight formation. As I swam in towards the school it parted around me and started swimming in a tight funnel with me in the middle. It was absolutely beautiful, and for a moment it felt like I was in a scene from the Blue Planet. The different experiences I have almost every time I go diving are incredible – deciding to learn as part of my trip is one of the best decisions I made. With the diving out of the way (sadly, on a budget, I have to restrict my diving only to places that are supposed to be fantastic, and no more than two dives per location), I was free to explore the island a bit more. So with a few friends from the dive shop, we hired a driver and set off round the island. It all started pretty well, as our first stop was the Tarsier Research Centre, the easiest place to see (protected) Tarsiers in the semi-wild. Round the back of the centre is a fenced-off part of the forest. They are pretty damn tiny, but luckily the centre provides a guide who knows where the little critters like to hang out, and within a couple of minutes we came across the first one – and they really are tiny – about the size of a fist – and absolutely adorable. 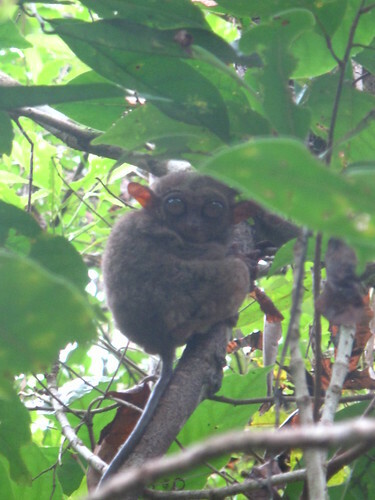 They sit there, gripping tightly onto tree twigs with their cute little fingers (proper big branches would be way too big for them) and staring at you with their enormous eyes – proportionate to their body size they are apparently about 150 times bigger than human ones, and take up most of the Tarsier’s head. They don’t do much, admittedly (being largely nocturnal) but hey, when you are quite that lovable then you can get away with it. Things started to go a little bit downhill after that. We stopped off at a little restaurant / backpackers place nearby called Nuts Huts, planning to a little walk through the jungle down to some falls, but unfortunately the heavens opened and we were stuck inside for a while. 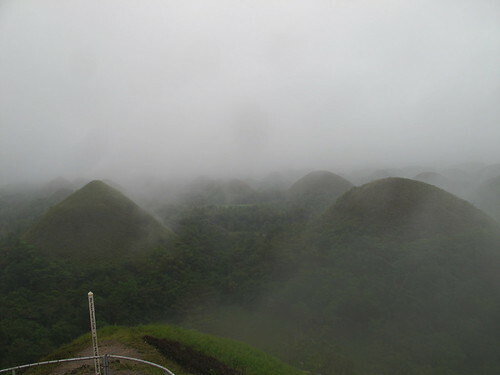 The rain eased off for a short while, allowing us to run back to the car and on to the next spot, the famous chocolate hills. Someone at the national tourist board must have decided that the hills are the country’s most beautiful asset, as I’d seen them countless times on posters and postcards since being in the country. And they sure do look good in the pictures. Unfortunately I am unable to confirm how good they look in real life – as the whole area was covered in thick cloud, so instead of seeing a landscape of dozens of odd little green hills, tightly packed together, all we could see was the two directly in front of us. While we got soaked. 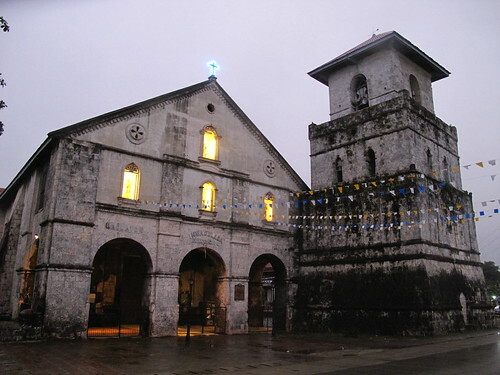 After sheltering some more in the cafe, we were soon on our way to the last attraction of the day – the oldest church in the Philippines. Unfortunately some faffing about on our part in the morning, along with the intervention of the weather, meant that we’d overrun our schedule quite a bit, and got there only to find it was closed. And getting dark. So we gave up and headed back to the beach. It could have been quite a disappointing day – but luckily my newfound monkey-love meant that seeing a few Tarsiers made it all worthwhile. All I have to worry about now is how to feed my addiction when I get back home. You can see all of my photos from Bohol here. 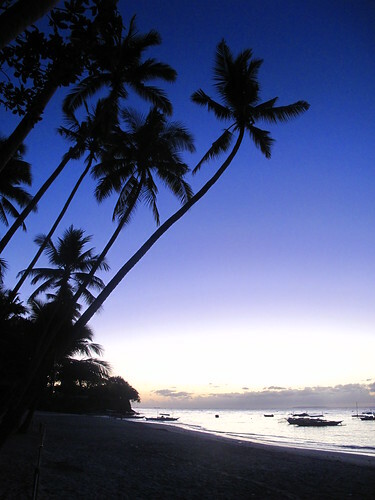 Next stop: Malapascua, and attempting to dive with Thresher Sharks. 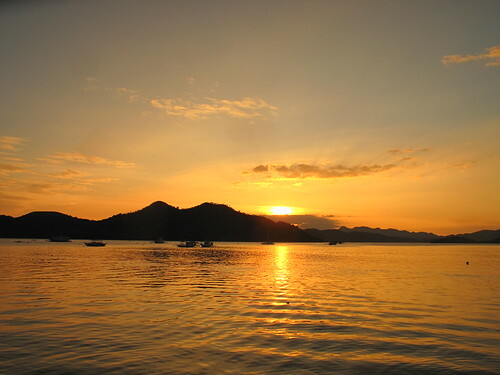 I was going to fly straight to El Nido in Palawan, but 6,000 pesos was a little steep – and then someone pointed out that it was only 995 pesos (about 15 quid) to fly to the island of Busuanga, just to the north of Palawan, and that made the decision for me. I hadn’t planned to stop in Busuanga, but with flights so cheap it made sense, especially as it gave me the chance to try out some of the finest wreck diving in the world. For on one night in 1944, the US Air Force sank a huge fleet of Japanese ships that were sheltering in and around Coron Bay. Sixty years later, many of them are in relatively shallow, diveable water, and they’re the main attraction for those visiting the island. 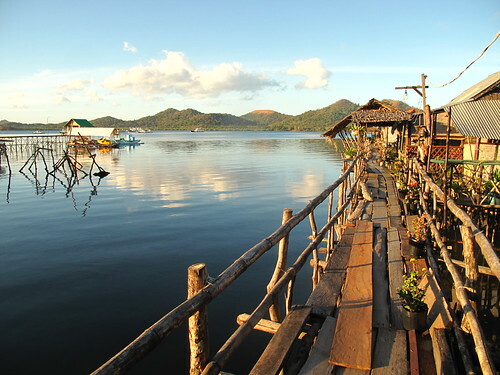 Some other people I’d met told me that Coron Town was a bit of a dump – but I loved it. 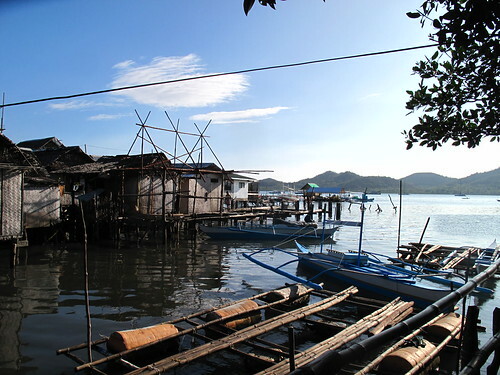 It’s certainly not going to win any architectural awards, but I loved its sleepy, ramshackle nature, and in particular the line of wooden shacks on stilts that jut out from the land into the bay. Quite a few of these operate as cheap hotels, and so I found myself sleeping in a hut right over the beautiful bay – for a mere 4 quid a night. Which is a bit of a bargain when you think how much that sort of thing would cost in somewhere like Tahiti (although admittedly with probably a tad more luxury). The morning after arriving I was up early to head out on a boat to dive two of the wrecks, the East Tangat wreck and the Olympia Maru, both of which were Japanese support ships, in around thirty metres of water. I’d already tried out wreck diving at the USS Liberty in Tulamben, Bali, but the reason I was so excited about these dives was the chance to actually penetrate the interior of the ships themselves. On going in I was suddenly worried I wouldn’t get to see anything after all – I had a slight cold, and for the first time ever I had difficulty equalising the pressure in my ears – which would rule out going any deeper. For a few minutes I had to hover at around three metres while I tried and tried again, and then finally, luckily, I managed it. Panic over and I soon joined the others on the bottom as we headed towards the wrecks. The outside of the wrecks were OK – there were a fair few fishes around, and lots of sponges and fans – but it was going inside that was the real fun. It was certainly the trickiest diving I’d ever done, as some of the entrances were pretty narrow, and it’s crucial to maintain good buoyancy control to ensure you don’t end up catching yourself on the edges. This is doubly hard because it’s quite difficult to perceive how much higher the tanks on your back extend – as well as to keep your legs level to stop them from catching at the back. I did OK, although a couple of times I got a little stuck, and I ended up scratching my legs a little on one of the narrower entrances. Luckily there were no deadly sharks in the area as I was slightly worried at the effect even a small amount of blood could have on any in the neighbourhood! Difficulty aside, it was great fun, a bit like being in an underwater assault course, and it was cool getting to see things like the propeller shafts and the huge old engines. I can’t see myself ever becoming an obsessive wreck diver – I prefer the colours of the reefs and the large numbers of fish, as well as the freedom of movement – but I’m glad I did it and would recommend it to any divers traveling in the Philippines (especially as I understand the only place with a bigger collection of diveable wrecks is Truk in Micronesia, which is much harder to get to. I would have loved to have spent a little more time in Busuanga, particularly to give the island hopping a go (which is supposed to be pretty spectacular), but sadly the boat schedule to El Nido meant we needed to leave the next day, or risk being stranded for quite a while longer. Are you bored of my sunset pictures yet? For some reason diving was never something that appealed to me, even though I have friends back home who do it and love it. I suppose I never really gave it all that much thought. It wasn’t until I tried skiing two years ago (another activity that I’d had zero interest in before) and loved it that I started to think that maybe there were other fun things I’d been missing out on that I should try, and that a year of travelling would be the perfect opportunity to give it a go. 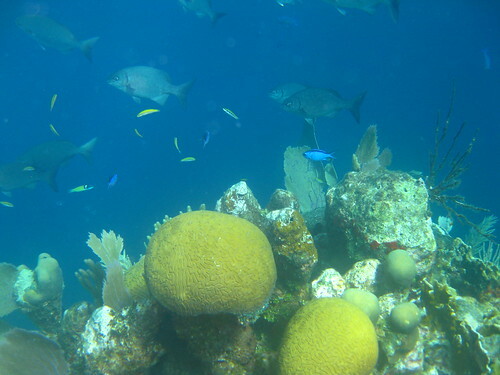 The second biggest coral reef system in the world (after the Great Barrier Reef) runs down the Caribbean coasts of Mexico, Belize, and Honduras. 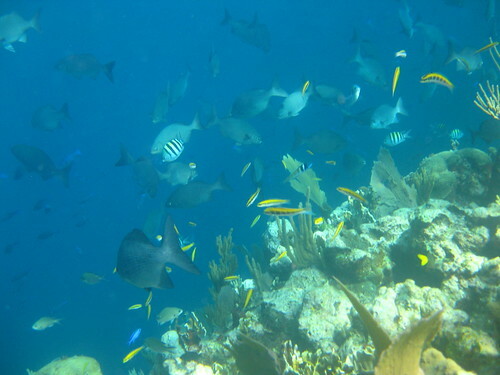 Mexico & Belize are probably the most famous places to see it, but the reef is just as good in Honduras, and even better (from a relatively budget traveller point of view) is that it’s one of the cheapest places in the world to learn, especially as all the dive shops include two free fun dives after the course, and free accommodation, in the package. The diving on Honduras is based around the Bay Islands, just off the north coast, and Utila is the backpackers’ mecca, famous for cheap diving and good partying – so that’s where I headed. One of the great things about travelling like this is you really don’t need a guidebook – just talking to other travellers heading in the opposite direction will normally give you all the advice you need, and so on on arrival I ignored the hoards of people trying to persuade me to come to their dive shop, and headed straight for the people from Alton’s, which had been recommended to me as one of the best places to learn, as well as having a very social atmosphere and rooms right on the waterfront, which sounded like the perfect combination. I had planned to do the PADI open water course, purely because that’s the most famous organisation worldwide, and figured that I’d probably need that to dive elsewhere. But on the drive from the ferry terminal down to Alton’s, an instructor called Lauren talked me into doing the NAUI open water course, which she’d be teaching, instead. I’d never heard of NAUI before but it’s another organisation like PADI that offers dive training. Apparently the reason they are much less famous is that the organisation is a not for profit that plows all the money back in to training and environmental programmes, rather on marketing like PADI. But unlike my Spanish lessons I didn’t choose to go with NAUI for right-on reasons – no, I went with NAUI because the time in the classroom is less and the time in water more. With two weeks of intensive classroom time fresh in the memory from Xela, it was an easy sell for me. It turned out to be a great decision. With PADI you spend the first day watching videos in a classroom. We started out straight away in the shallow water at the end of the dock, first with some simple swimming and floating exercises, and then moving on to using all the diving equipment apart from the regulator (which you breathe through) and oxygen tanks – which are the mask and snorkel, weights (to help you get down to the bottom more easily) and the BC (bouyancy compensator – a jacket which you can fill with air to adjust your bouyancy levels). After explaining how they all worked, we then went out on the boat to get our first experience of the reef skin diving (i.e. snorkelling but with weights & the BC). The great thing about this way of learning is that you get familiar with everything else first without having to worry about the regulator and tanks, meaning the next day on our first dive, there would be less new stuff to take in. It was also nice to know that while we were already out getting to see the spectacular reef while the PADI students were still stuck back in the classroom. The nest morning we spent time with Lauren, our instructor, going through all the science bits face to face (explaining how bouyancy works, and the effects of pressure on air and the body), which I much preferred to having to watch a video, and then in the afternoon we got our first experience of diving, again in the shallow water off the dock. This was our first opportunity to try out the skills I was most worried about – taking the regulator out underwater, and most scary, taking the mask off and putting it back on again, and then clearing the mask of water. 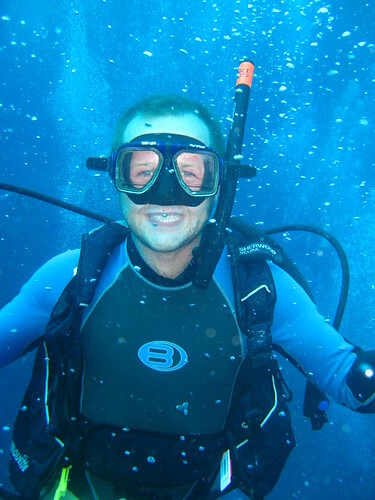 I was amazed to find that breathing underwater was far easier and felt far more natural than I’d worried, and I felt comfortable straight away. Taking the regulator out and putting it back in again was similarly easy. Even taking the mask off was much easier than I’d feared – I got a bit panicy at first and managed to inhale a bit of water through my nose, which had me frantically coughing through my regulator, but I soon managed to get a hold of myself and remember everything Lauren had taught me, so I relaxed, slowed my breathing down and soon I was fine (although it did take me several attempts to clear the mask). I must give a lot of credit to Lauren – she is an amazing instructor, explaining everything slowly and clearly, checking at every step of the way that we were OK, and making sure she congratulated us with an underwater fist bump after completing every step. I felt in very safe hands, which makes a huge difference at helping you relax in such an unnatural situation. With all the skills mastered, the next step would be our first proper dive the following afternoon. I felt pretty confident about it, which is probably why I made the mistake of going out that night. Wednesday night is the biggest party night of the week in Utila, and with such a friendly crowd, before I knew it I’d made it up the Bar in the Bush, the one place that opens really late, playing drinking games with a group of mad French Canadians. Whoops. Staggering home at 3.30am it suddenly hit me that getting way more drunk than I had done on any night since I left England the night before my first dive was not the best idea in the world. When I woke up the next morning I felt like death. 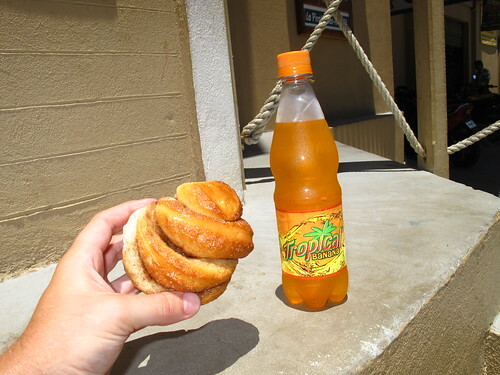 Hangovers are even worse when you haven’t had one for a while, so I spent the morning guzzling gallons of water and coffee, and topping up my sugar levels via several cinnamon buns (which are a bit of an island speciality) and drinking Tropical (a Honduran speciality, a ridiculously sweet, bright yellow banana flavoured fizzy drink). It was touch and go, but by the time the boat left at lunchtime, I was just about feeling human. Thank god I was in the only group in the school that was diving in the afternoon that day, as I think I’d probably have drowned if I’d gone out in the morning. In the end it all went fantastically – practising the mask removal skills underwater was much easier this time, and then after that we got to swim around marvelling at the reef. It’s absolutely beautiful, and so peaceful down there. Diving itself is actually a very unenergetic activity, once you have your bouyancy levels right you just float around, with minimal effort from the legs, just taking in all the colours and the sights underwater. The different types of coral are stunning, and it’s such an amazing experience to have big schools of fish swimming right round you. Aquariums will never be the same. As well as all the fish and coral, we saw rays, lobsters (looking much happier than they do in tanks in restaurants, funnily enough), crabs, starfish, seahorses and some pretty cool eels. Only major disappointment for me was that we’d just missed the whale shark season, as they are supposed to be pretty spectacular. were able to spend our fun dives spending more time seeing the reef, and taking underwater pictures (which turned out to be the toughest of the skills I’d tried – managing to stay totally still to get the best picture takes a bit of practice, especially as your natural tendency is to hold your breath to stop bubbles getting in the way, and holding your breath makes you more bouyant, so before you know it you’re half way to the surface). All in all it was better than I could have hoped, and I definitely plan to do my advanced course when I get to Asia (especially if I can find a NAUI shop there, as you get to dive down to 40m on the NAUI advanced course as opposed to 30m with PADI). Almost Fearless will be spending six months traveling through Latin America, starting, like me, in Mexico. Really looking forward to following how she goes, as I’ll be following a similar path in March. One Giant Step will be spending three months in South America from June 2009 – meaning they’ll hit Peru just before I get there. Sam and Will have just done the Torres del Paine circuit in Chile. I wasn’t sure I’d be able to fit it in, but it sounds so great I might have to try and find a way. 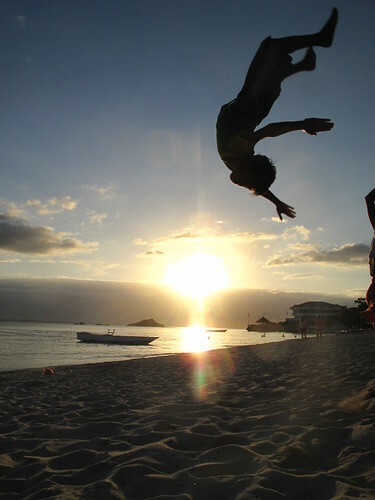 I’m hoping to learn to dive in Honduras, which will enable me to dive in Indonesia & the Philippines. 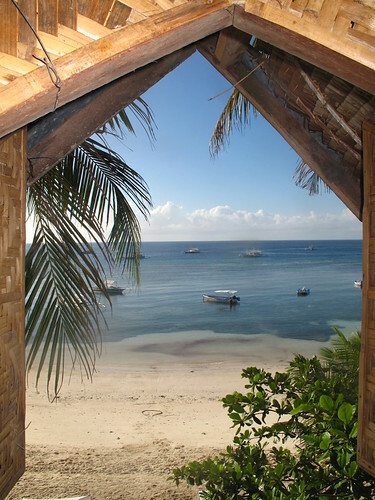 Globestompers have a great report on Sipadan in Indonesia. I’ve mentioned him before ages ago, but Gallo Moa’s photography continues to amaze me. He’s really come into his own with his portraits of people in India, but the whole blog is worth a read, as he’s traveled through some more unusual destinations, including Armenia, Iran, and Georgia (unfortunately it all kicked off while he was there), taking great photos everywhere along the way. He’s also obsessed with photographing bicycles, which is pretty cool. Last but by no means least my friend Adrian has been showing that you really don’t need to go away to be a traveller, especially when you live in London – firstly through the brilliant shop name geography, where he explores the visible influence of London’s immigrant communities by way of shop names, and enjoying football with Norwegian fans, the latest in a series of posts where he enjoys football matches with expat communities in the city.